When I came across the recipe of Zha Jiang Noodles (炸醬麵) on Almostbourdain, I said to myself, I’d make it one day. That “one day” had come eventually. I often cook rice not noodles for dinners. After moving to Australia, I still try my best to keep the Chinese tradition and cook 3 dishes with one soup for dinner. If I’m not wrong, Ellie asked me twice on twitter, that if I still followed the Chinese tradition making 3 dishes. My answers were “yes” and “no”. I would try to, as long as I have time and energy. Honestly speaking, many things would get into my way so that I can’t keep this tradition. For an instance, my daughter needed to go out before 5:30pm the other day. Apart from the time constraint, cooking dinner that early was not my default mood. Then Ellie’s Zha Jiang noodles came up in my mind instantly. It’s a yummy quickie, good for meals at any time, for lunch, dinner or supper. For making this dish, all you need is to get the “sweet bean sauce” with Shanghai noodles. Both of them are easily found at any Asian grocery stores. For the vegetables and minced pork, I think it’s not a problem for you at all. Heat a wok or frying pan with oil. Add pork mince (Note: I mixed it with marinade for 15 minutes before stir frying.) and stir fry until brown. Add ginger and garlic and stir fry together with the pork mince until fragrant. Add sweet bean sauce, dark soy sauce and mix until combined. Add 1/2 cup of water/chicken stock, bring to a boil and then lower heat to a slow simmer until sauce is thicken. Add sugar to taste. Cook the noodle according to packet instructions. Drain and put into four individual serving bowls. Divide pork mince into 4 equal portions and pour on the noodle. Sprinkle with chopped spring onions and garnish with shredded carrots and cucumber. Yum!!! I love those noodles...They look exactly like the way my mom's noodles are. I wrote a post about them recently too. :) Same thing, just different noodles because we didn't have the thick ones at the time. Christine, your dish looks really good!!! I am craving for a big bowl now. Thanks for the shout out! This is good! My daughter's fave. Perhaps I'll cook this for her one day. Christine! You would certainly make Ellie proud with this dish! It is such a gorgeous dish - all that colour with the veggies. But one thing - I thought you were going to make your own noodles with the pasta machine! LOL! Aw, Trissa, do you know how to read people's minds? I've been thinking of making these Shanghai noodles myself with my new kitchen toy when writing up this post, seriously! This looks so yummy, Christine. Must try one of these days! Kind of you to share! This looks delicious. when I saw the title in my google reader I thought it would be similar to Korea's Jja jang myun which is also a black bean sauced noodle but they look totally different. 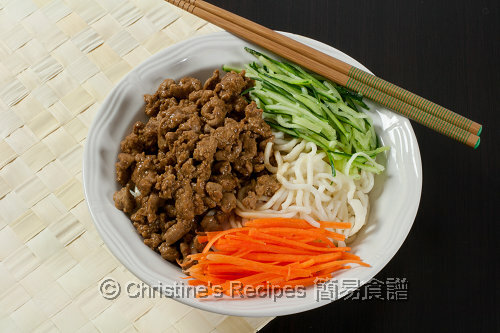 I love Zha Jiang Mian and I really wish I can try yours, looks so delicious. Your Zhajiang noodles is very tempting. I tried making this long time ago and have not made it ever since. I hv been revisiting my old dishes and giving them new life. Maybe I should cook Zhajiang noodles again. lovely, lovely plate of noodles! Sure, with a bowl of this nice zha jiang noodles in front of me, I will swallow it immediately. Isn't your pasta machine having a vacation : )?!. Oh wow, this looks just super incredibly delicious. Its on my list to make in the enar future. Thanks for introducing me. 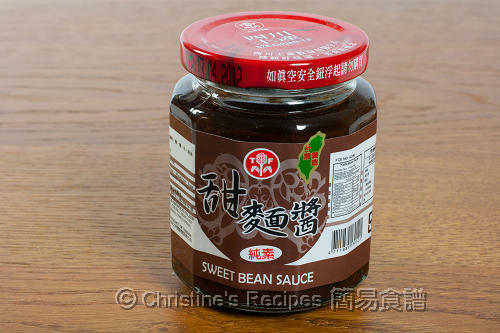 Hi Cristine, I wonder if sweet bean sauce is the same as ground bean sauce? Thanks! And I love your blog. Greetings from Houston, TX. 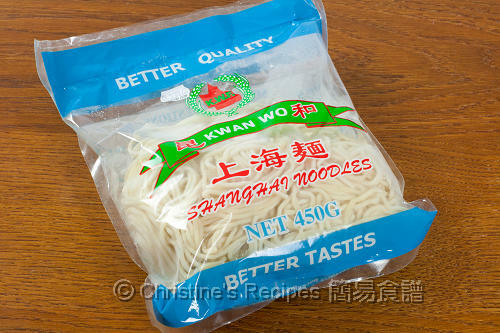 Christine - these noodles look wonderful! I couldn't find sweet bean sauce. Can I substitute with ground bean sauce? Some ingredients in both sauces are different. But the basic one is soy bean. The taste is quite different. I have made these noodles many times now. Thank you for sharing such wonderful recipes! Glad you like it. The credit should be Ellie's. Hi Christine, I just made this for dinner tonight and it was delicious! I didn't have sweet bean sauce on hand and used ground bean sauce instead. I also opted to add the carrots to the pan after the ginger and garlic b/c I prefer the taste of cooked carrots. I also added bean sprouts. Next time I'll try this with sweet bean sauce. Many thanks for sharing this on your site! Glad that you love this recipe. Best of all, it's quick and yummy. Yeah, the sauce will make a big difference. 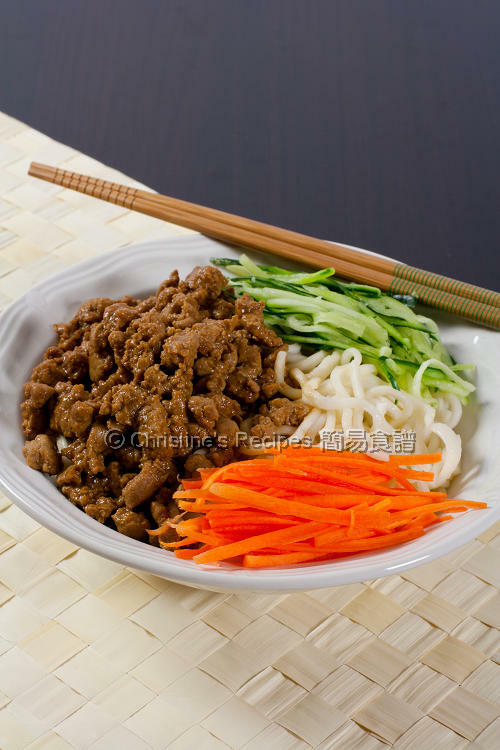 Is minced pork the same as ground pork? Or is it not as finely prepared? Yes, we call minced pork (pork mince) here, the same as ground pork called in US.